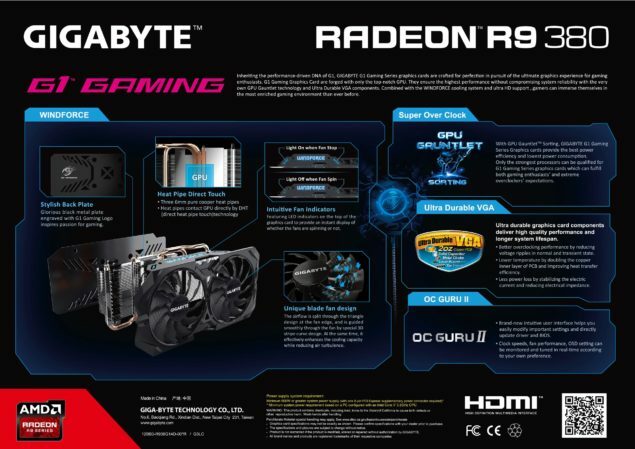 Gigabyte seems to have leaked AMD’s upcoming Radeon R9 380 and Radeon R9 390 series graphics cards through a data sheet slide. The slide leaked on hardwareluxx has two performance tier cards of the Radeon 300 series lineup which will be introduced in a few weeks and showcased during Computex, starting today. The data sheet offers brief details regarding the G1 Gaming design from Gigabyte and doesn’t reveal any key info regarding the graphics cards. AMD is going to launch an entire top-to-bottom Radeon 300 series lineup that will include custom built cards and from the looks of it, the cards have long been under production and ready to hit retail anytime. The recent NVIDIA launch and price cuts for their GeForce 900 series cards may trigger a reaction which prompts AMD to quickly launch or announce their cards during Computex with a more formal event planned in mid-June during E3 2015. AMD currently has a major card, rumored to be codenamed Radeon Fury, which features their high performance Fiji GPU core and is the first HBM compliant graphics card in the industry. It can be expected that AMD will paper launch the card to show what they have for consumers in their sleeves. 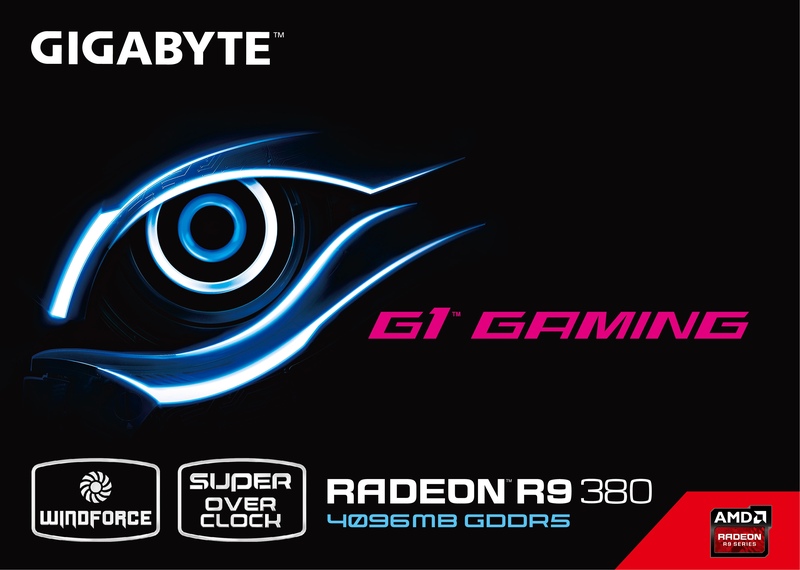 Coming to the Gigabyte cards, Gigabyte has three cards leaked out all of a sudden. The first one is the Radeon R9 380 G1 Gaming which features the WindForce x2 cooler. The new revision has a design scheme from the WindForce x3 coolers that will be adopted by the high-end cards featuring two PWM controlled fans with a unique blade design that push airflow to a central aluminum fins based heatsink that has three 6mm heatpipes running through the heatsink and making direct contact with the GPU surface to efficiently dissipate heat. The card also includes a backplate which we have seen on previous iterations of Gigabyte coolers and a WindForce LED indicator that lits up in blue color. The second cards leaked were part of the Radeon R9 390 series that include the Radeon R9 390 and R9 390X. There are no specifications provided except that the Radeon R9 380 comes with 4 GB of GDDR5 VRAM. When specifications are talked about on the Radeon R9 300 series cards, it can be expected that most of the cards will be rebranded from the 200 series lineup. The Radeon R9 380 is the Tonga Pro based Radeon R9 285 which has 1792 stream processors, 128 TMUs, 32 ROPs and a GCN 1.2 revision core. The card has a 256-bit interface that allows a 4 GB GDDR5 VRAM. The Radeon R9 390 and 390X are based on the Grenada / Hawaii core which has the same specifications of the Radeon R9 290 and 290X graphics card except they feature slightly higher clock speeds and 8 GB GDDR5 VRAM. On the other hand, we know that Hawaii offered in the 300 series family will be a 8 GB card as it will be based on custom designs at launch. The second card which we believe is Tonga is also quite spot on with the leaks, we know that the Radeon R9 285 Tonga features just 2 GB VRAM across a 256-bit bus. It confirms why we see a sudden VRAM gap between the Radeon R9 370 which is the Pitcairn based card that does come in 4 GB VRAM models. There’s a possibility that AMD introduces the full Tonga XT chip with 2048 stream processors in the line with 4 GB VRAM as the Radeon R9 380X. Rest of the lineup includes the Bonaire XT and Bonaire Pro based Radeon R7 360X and Radeon R7 360 cards which feature just 2 GB GDDR5 VRAM. It will be interesting to see how AMD prices these cards against the already competitive 200 series and Maxwell based GeForce 900 series from NVIDIA.